Sasha Vujačić is a Slovenian basketball player, who plays for the New Jersey Nets. Though he has played the point guard position in Europe, he found more playing time at the shooting guard spot while in the Lakers' triangle offense. Appeared in 67 games (one start), averaging 2.8 points and 1.2 rebounds in 8.6 minutes … Scored in double-figures three times … Led team in assists once and in steals seven times … Posted 11 points (3-6 3FG), five rebounds, two assists and two steals 1/3 vs. Dallas … Scored 10 points (3-5 FG) 1/15 vs. LA Clippers … Scored eight points in only start of season 4/8 at Denver … Scored 2,000th career point, posting season-highs in points (13) and rebounds (6) 4/13 vs. Sacramento … Scored eight points before leaving the game in the second quarter with a left ankle injury 4/14 at LA Clippers … Missed eight games (2/23-3/7) with a sprained right shoulder ... Appeared in 10 playoff games, averaging 3.1 points, 0.8 rebounds and 0.5 assists in 7.6 minutes ... Totaled a postseason-high nine points (3-6 FG, 2-4 3FG) 6/15 vs. Boston ... Scored the final two points of the 2010 NBA Finals on a pair of free throws with 11.7 seconds remaining to help clinch the Lakers Game 7 victory 6/17 vs. Boston. Appeared in 80 games, averaging 5.8 points, 1.7 rebounds, 1.4 assists and 0.96 steals in 16.2 minutes … Scored in double-figures 16 times … Led team in steals 13 times … Posted a career-high tying four steals 11/18 vs. Chicago … Posted season-highs in points (17) and assists (6) 12/28 vs. Golden State … Totaled 12 points and a season-high tying six assists 1/7 at Golden State … Missed two games with back spasms (1/13, 1/14) … Posted 12 points (4-4 FG, 2-2 3FG) 3/19 vs. Golden State … Tallied 14 points (3-3 FG, 6-6 FT), five rebounds and three assists 4/1 at Milwaukee … In 23 playoff games, averaged 3.0 points, 1.4 rebounds and 0.43 steals in 10.9 minutes ... Scored a postseason-high nine points 4/25 at Utah … Equaled a postseason-high with nine points (4-7 FG), three rebounds, two assists and a steal 5/17 vs. Houston. Appeared in 72 games, averaging 8.8 points, 2.1 rebounds, 1.0 assists and 0.50 steals in 17.8 minutes ... Ranked among league leaders in 3-point FG% (8th/.437), setting a then single-season franchise record for 3-point FG% … Scored in double-figures 29 times including four 20+ point games … Led team in scoring once … Totaled a career-high tying 22 points (19 in 4th quarter) and season-high three assists 11/29 vs. Denver ... Scored 14 points (all in 4th quarter) 12/16 vs. LA Clippers … Posted a team-high 19 points and season-high three assists 12/18 at Chicago … Tallied 11 points and a season-high seven rebounds 1/23 at San Antonio … Posted 20 points and a season-high three assists 1/29 vs. New York … Scored a career-high tying 22 points (8-10 FG, 4-5 3FG) 2/1 at Toronto … Scored 1,000th career point 2/3 at Washington … Totaled 19 points (5-11 3FG) and a season-high three assists 3/24 at Golden State … Scored 20 points (career-high six 3FG) 3/30 vs. Washington ... Appeared in 21 postseason games, averaging 8.1 points and 2.2 rebounds in 21.7 minutes ... Scored a playoff career-high 20 points (7-10 FG, 3-5 3FG) 6/10 vs. Boston. Played three seasons (2001-04) for Snaidero Udine ... In 2003-04, appeared in 30 games for Snaidero Udine of Italy’s top professional league, averaging 14.4 points, 3.7 rebounds, 2.3 assists and 2.4 steals ... Signed a contract with Snaidero Udine at age 16 ... Grew up with Polzela (Slovenia) youth teams ... Debuted with Polzela during the 1999-00 season ... Moved to Italy for the 2000-01 season ... Member of the Slovenian Junior National Team ... Won silver medal at the 2002 European Junior Championship ... Was a member of Slovenian Under-20 National Team. Full name is Aleksander Vujacic, nicknamed Sasha ... Has a sister Nina (17) and brother Alijosa (16) ... Studied economics in high school ... In addition to basketball, enjoys playing beach volleyball, tennis and soccer ... Is an avid golfer after taking up the sport during the summer of 2007 ... Lists greatest personal achievement as being drafted by the Lakers ... Person he admires most is his late grandfather ... Enjoys reading and listening to music ... All-time favorite movie is “The Godfather” ... Favorite food is anything Italian made by his mother Ksenija ... Enjoys traveling and ranks St. Tropez (France) as the best vacation spot visited ... Most memorable non-NBA game was during his rookie season with Snaidero Udine when he connected on the game winning shot versus Kinder Bologna ... Participated in the NBA’s 2007 Basketball Without Borders Asia program, the NBA’s international outreach program designed to teach the game and focus on HIV/AIDS awareness and education ... Traveled to Shanghai, China to help coach a 3-day clinic for 50 top young participants from 17 countries throughout Asia as part of the BWB program ... Active participant in Lakers Community Outreach programs including “A Season of Giving,” and “Read to Achieve” ... Unveiled both the 12th Lakers Reading and Learning Center at the Boys and Girls Club of East LA (October 2008) and the Lakers 14th Reading and Learning Center at the Salesian Boys and Girls Club of Los Angeles (June 2009) ... Spoke with elementary school students about his healthy habits and then led them in fun exercise activities during the Lakers inaugural "Fit For Life" Timeout ... Spoke with kids about life and basketball at Camp Lakers 2009 graduation ceremony. He is engaged to Maria Sharapova, the famous tennis player. 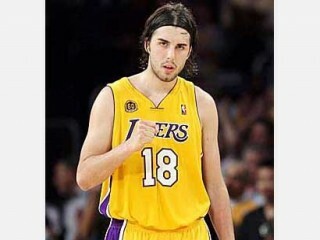 View the full website biography of Sasha Vujacic.